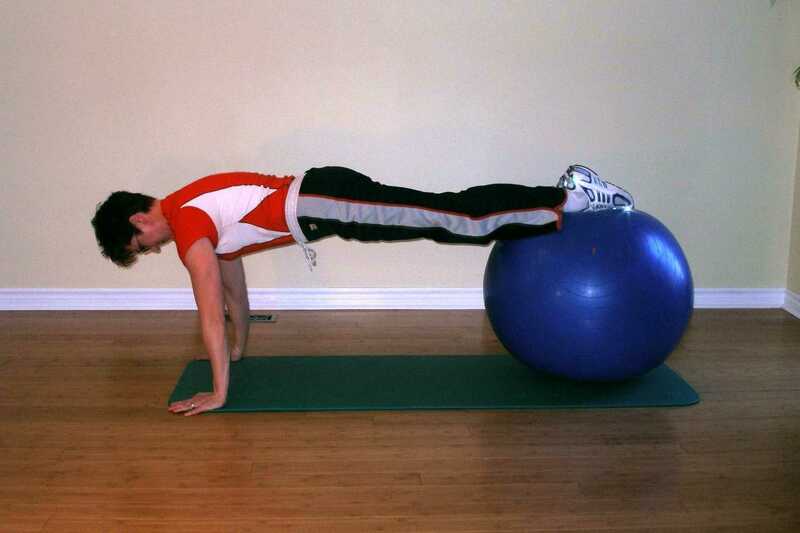 Start this exercise ball exercise as you did for the Ball Plank. Kneel in front of the ball and slide yourself forward over the exercise ball. Walk forward as you did in the Ball Walkout until your feet are over the top of the ball. Hands should be shoulder width apart situated directly under your shoulders. Lift one foot a couple of inches off the ball. Pull the ball toward your chest with the other leg. Pause 2 seconds and then return the ball to its starting position. Lift the other leg off the ball and repeat the above. Always stop and rest if you feel your hips are sagging or if you are no longer able to maintain the neutral position. If you find this too diffiult, go back and try the Ball Plank Knee Tuck. Perform multiple repetitions on one side before switching legs. This is considered an advanced exercise ball exercise because you have a small base of support, and you must maintain neutral position while a loaded limb is moving. Your centre of gravity changes and your base of support changes throughout the exercise.